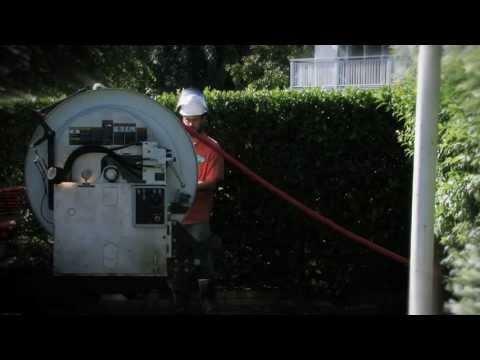 Central San provides wastewater collection, treatment, and disposal services; recycled water production and distribution; and household hazardous waste collection. 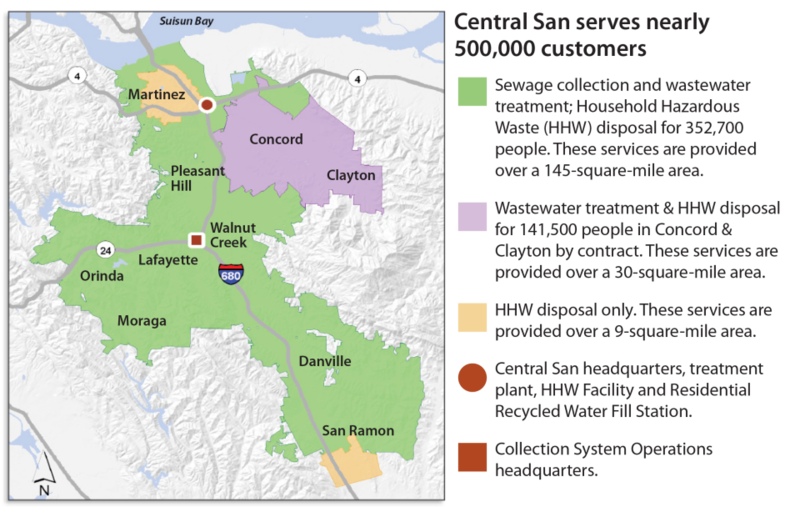 Central San serves nearly half a million residents and more than 3,000 businesses within a 145-square-mile service area, which includes Alamo, Danville, Lafayette, Moraga, Orinda, Pleasant Hill, Walnut Creek; portions of Martinez and San Ramon; and unincorporated communities within central Contra Costa County. Central San also cleans the wastewater from the cities of Concord and Clayton, and they maintain their collection systems. Established in 1946, Central San is a special enterprise district with a five-member elected Board of Directors. To be a high-performance organization that provides exceptional customer service and regulatory compliance at responsible rates. In the 1940s, central Contra Costa County was a rural area of farms, orchards and a few small towns. With the end of World War II, a building boom began. As the nearby cities of San Francisco, Oakland and Berkeley grew, so did the population of Contra Costa County. This ultimately resulted in a sanitation crisis with most of the county depending on septic systems, often inefficient due to the area’s heavy adobe clay soil. At the time, State health authorities considered the polluted conditions arising from those septic tanks to be among the worst in California. With septic tanks overflowing and waterborne diseases such as typhoid becoming a potential threat, civic leaders rallied public support for a solution. In an election held on June 24, 1946, a proposal to form a sanitary district for areas of central Contra Costa County was approved. 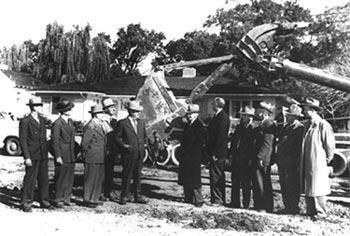 On July 15, 1946, the County Board of Supervisors passed a resolution officially creating the Central Contra Costa Sanitary District (Central San). Work began immediately and within 26 months, Central San’s newly constructed main sewer trunk line and treatment plant were operational. At that time, Central San’s service area population was 15,000; the treatment plant’s capacity was 4.5 million gallons per day; and the collection system consisted of 50 miles of sewer pipe. That original system was expected to handle the area’s wastewater for at least two decades. But by 1952, it was obvious that demand would soon exceed capacity. Central San began a series of expansions and improvements to meet the needs of a rapidly growing population – activities that have continued throughout the District’s history. Enormous changes have occurred since the District’s beginnings in 1946 as a small agency serving a rural area: the size, population, and characteristics of our service area; the processes and technologies used to treat and collect wastewater; the environmental awareness and stricter water quality standards and regulations. What hasn’t changed is our unwavering dedication and commitment to protecting the public health and the environment. Watch a visual profile of Central San!